QuesTek Innovations and Solar Atmospheres explain the manufacturing and processing of a new class of vacuum-carburized gear steels with very high hardenability. 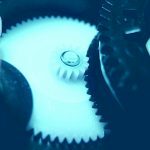 Carburized steel gears are widely used for power transmission in rotorcraft, transportation vehicles, agricultural and off-road equipment, industrial rotating equipment, and thousands of other applications. Historically, alloys requiring carburization were put through an atmosphere (gas) process. However, in recent years, the advancement of low-pressure (i.e., vacuum) carburizing has lead to certain applications to take advantage of reduction in process steps and improvements in case profile uniformity. 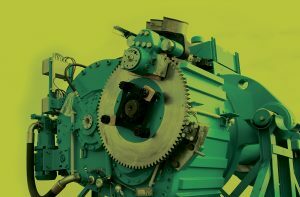 A new class of gear steels, Ferrium® C61 and C64, were specifically designed and developed to maximize the benefit of vacuum carburization processes. Ferrium C61 and C64 are highly hardenable, secondary hardening martensitic steels. The high hardenability of these alloys allows for a mild gas quench, which can used in vacuum carburizing, that promotes uniform martensitic transformation throughout the entire component allowing for less distortion and thus reducing the amount of grinding stock removal required. These alloys were also designed with a grain pinning dispersion particle that allows for the use of higher processing temperatures available in vacuum carburizing to increase the carbon diffusion and reduce cycle time. 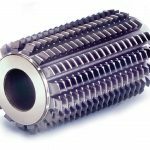 The grain pinning dispersion particle also allows for increased forging temperatures in gear production that can extend the life of a forging die. In addition, the alloys use an efficient M2C carbide that requires less carbon content than traditional alloys that achieve hardening using an epsilon carbide. 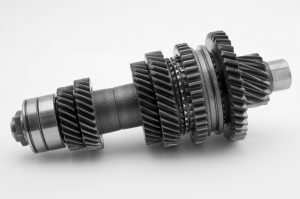 In addition to the manufacturing benefits outlined above, these alloys also have significantly improved core properties that lead to performance advantages compared to conventional gear steels. A comparison of atmosphere and vacuum carburizing addresses some of the advantages and disadvantages of each will be presented. With the advancement of vacuum carburizing processes in recent years, there are a growing number of applications that make the use of vacuum carburizing an effective processing selection. A framework comparison of a high-performance racing and high-performance aerospace application are used as two examples that can benefit from the use of these new alloys processed via vacuum carburizing. Ferrium C61TM and C64TM are two new alloys being used or considered for power transmission applications. Both of these alloys utilize an efficient nanoscale M2C carbide strengthening dispersion within a Ni-Co lath martensitic matrix. 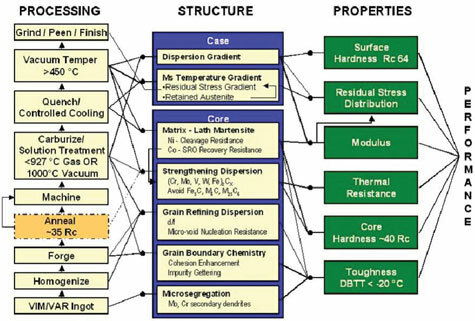 QuesTek designed these alloys considering the complex interplay of critical design factors including: martensitic matrix stability (Ms temperature); M2C carbide thermodynamic stability and formation kinetics; matrix cleavage resistance; and embrittling phase thermodynamic stability with the use of their suite of computational models [1, 2] (Figure 1). QuesTek’s Ferrium C-series alloys are advanced new gear steels designed for significant manufacturing and performance advantages over conventional aerospace gear steels that can significantly streamline gear production, decreasing lead times and reducing cost. These steels take advantage of vacuum carburization thermal processing and have high-hardenability that allows for mild-gas quenching, eliminating the need for oil-quench dies, thus reducing the amount of machining stock required due to distortion. The alloys were also designed to use an efficient strengthening mechanism that requires up to 50 percent less carbon compared to current state of the art alloys, therefore reducing the carburization time by up to 50 percent. In addition to the manufacturing benefits the alloys also have performance enhancement benefits that allow for increased power transmission, reduced weight, and increased thermal stability. Computationally designed and developed by QuesTek Innovations, under Navy, Army, and internal funding, the alloys are commercially available from Latrobe Specialty Steel Company located in Latrobe, Pennsylvania. Commercial procurement and processing specification documents, such as Aerospace Materials Specification (AMS), are currently in development. • Elimination of separate hardening and oil quenching process steps after carburization (combination of carburizing and austenitizing steps; Figure 2); can double the efficiency of a current facility by elimination of many copper plating and stripping operations associated with current thermal processing, and eliminate of the costs and setup time associated with custom quench press dies currently required. • Reduction of grinding operations and costs, smaller excess stock removal and waste by reducing quench distortion and avoidance of the intergranular oxide formation typical of in pre-oxidation steps of conventional alloys. Due to higher hardenability of Ferrium gear steels (Figure 3), a slower gas quench process resulting in uniform properties and very low distortion after heat treating can be achieved. This can be especially beneficial for components with larger cross-section where cooling rates in the core may be slower. These alloys were designed to be worked at higher temperatures compared to the incumbent alloys. The reason behind this is the increased thermal stability of the grain pinning dispersion used. Where alloys such as X53 typically have grain pinning dispersion particles that go into solution around 1830°F, the particles employed in Ferrium gear steels are stable to 2250°F. This allows an increased forging range by over 300°F. This increase in temperature also allows increased throughput and longer die life. 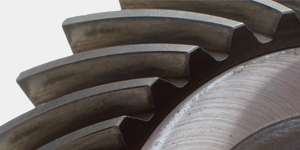 These alloys exhibit core steel tensile strengths (UTS) of 229 ksi or more, which is a 35+ percent increase compared to conventional gear steels and allows significant reductions in part size and weight, particularly where structural components are integrated with gearing into single components. 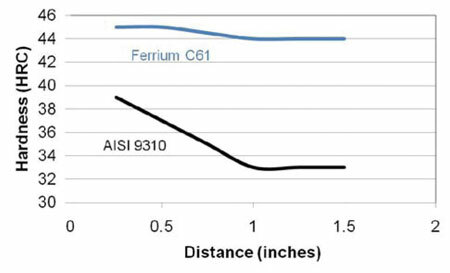 Ferrium C-series alloys exhibit increased thermal stability compared to AISI 9310 or Pyrowear X53, because they were designed to be tempered at 900°F or 950°F, and thus can withstand service temperatures up to 500°F hotter than AISI 9310 or Pyrowear X53. 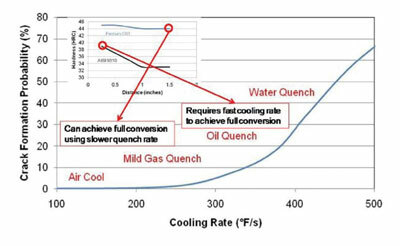 Increased thermal stability is expected to result in greater ability for a gearbox to survive “oil-out” or low lubricant situations, and endure other high-temperature operating conditions (Figure 4). Additional information about the properties and development status of each alloy can be found in 09FTM14, Design, Development and Application of New High-Performance Gear Steels. 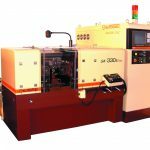 The history of case hardening via carburization has been well presented over the years. 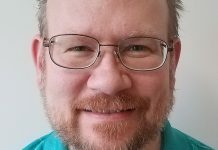 While atmosphere carburization still is the predominant processing method used, vacuum carburization has been starting to make progress as the preferred process in certain applications. 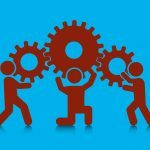 While some consider these competing technologies, they may be considered complementary as each processes has benefits given the application involved. Atmosphere carburizing is still cost effective for large batch production and extremely large components, while vacuum carburizing is cost effective for lower batch production and precision applications (where machining tolerances are pertinent). 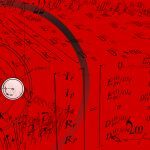 There is still a broad range of applications in between the above examples where both processes will work effectively, but typically is decided by a judgment call or preference on the part of the material and processing or manufacturing engineer responsible for the thermal processing. A summary of the advantages and disadvantages of both atmosphere and vacuum carburizing are given below [3, 4]. A typical gear manufacturing path is outlined in Figure 5. From this process you will see that the advantages of vacuum carburizing are contained within both the hardening and grinding processes. The amount of steps contained within each of these two processes is different for various applications. Two examples in the racing and aerospace markets will be outlined below to describe the step reduction and potential time and cost savings. 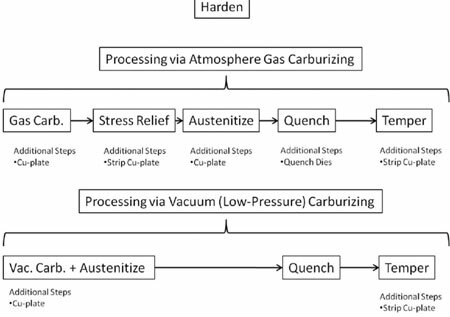 A more detailed breakdown of the hardening process comparison between atmosphere and vacuum carburizing is shown in Figure 6. As shown, the advantages of vacuum carburization allow for a combination of carburization and austenitizing steps, while eliminating the need for a stress relief in between the processes. In addition, the increased temperature capabilities of vacuum carburization allow for increased diffusion of carbon, therefore reducing total cycle time. The use of vacuum carburizing can reduce the need for quench dies due to the more uniform case profile, allowing for more uniform martensitic transformation (less stress gradient associated with phase change from FCC to BCC) and reduce the amount of distortion contained within a component. In addition, the use of high hardenable alloys, Ferrium C61 and C64, allow for mild gas quenching that even further reduces the distortion caused by non-uniform conversion [5, 6] (Figure 7). 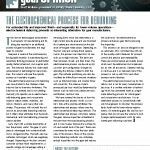 Processing of Ferrium C61 and C64 has also demonstrated that the need for a pre-oxidation step is not required for activation prior to carburization; instead hydrogen cleaning can be using during the heating stage of carburization/austenization. The amount of masking operations can also be reduced by the use of vacuum carburizing. In traditional atmosphere carburizing, a stop-off paint or copper plate will need to be applied and removed twice throughout the hardening operation. The number of masking steps can be reduced by 50 percent using vacuum carburization due to the integration of the carburizing and austenitizing steps. This means that a given production line can double its through-put of the same plating line by using vacuum compared to atmosphere carburizing. The gear grinding process also receives benefit from vacuum carburizing compared to atmosphere carburizing. 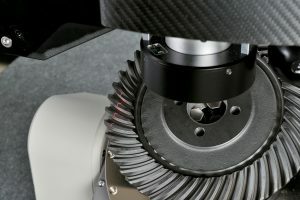 A comparison of the grinding operations for a high-performance racing and aerospace application are outlined in Figure 8. After thermal processing there are three main reasons for material removal: removal of an intergranular oxide layer, removal of any remaining primary carbides due to over-carburization, and removal of any remaining distortion. In a typical racing application where the tolerances have less restrictions and the risk of failure due to primary carbides will not lead to catastrophic loss, the main grinding operation is completed for removal of the inter-granular oxide layer. 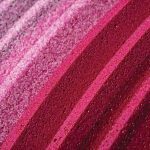 When processing via vacuum carburizing, this inter-granular oxide layer is no longer present and can typically eliminate grinding operation altogether. 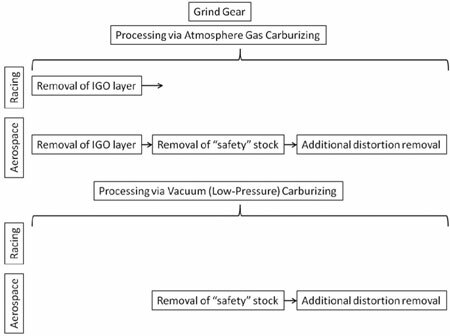 In a typical aerospace application where the tolerances are very restrictive and the risk of failure due to primary carbides may lead to catastrophic failure, the grinding operations consider all three factors mentioned above. In atmosphere carburizing there is the removal of the inter-granular oxide, removal of a set amount of stock that has historically shown primary carbides, and removal of any additional stock that is due to distortion. When processing via vacuum carburizing, the inter-granular oxide layer is eliminated and the amount of material removal due to distortion is reduced due to uniform case conversion. The use of Ferrium C61 and C64 further reduce the amount of material required to remove distortion due to the high hardenability that allows for even milder quenching, while still achieving full martensitic conversion. 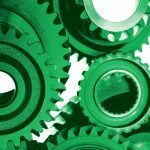 This paper will focus on manufacture of a gear for high performance racing and aerospace applications. These two applications were selected based on the high performance requirements and the precision manufacturing process that would receive the most benefit from adoption of a new class of higher strength and toughness gear steels. In each instance, a step by step manufacturing comparison will be made compared to 9310, a standard baseline for these high performance applications, using both the atmosphere and vacuum hardening processes. The high-performance racing application will focus on small lot production that is manufactured through a supply chain of vendors. One such example is a ring gear used in the transaxle of off-road racing vehicles. A typical batch size for this would be on the order of twenty-five components. The process would start with procurement of bar stock from a mill or third party vendor. Then a forging house would cut blanks and ring-roll to the desired shape, annealed, and ground/grit blasted. The forging blank would then be sent to a machining house to cut the gear teeth. The gears will then under-go a hardening process that consists of carburization, austenitizing, quenching, cryogenic treatment, and temper (in the case of atmosphere carburizing, a machining step may be inserted after the carburization and prior to the austenitizing step). Throughout the hardening process there may be several steps of masking and cleaning using paint. Lastly, gears are then shipped back to the machining house for lapping prior to assembly in the final application (Figure 9). 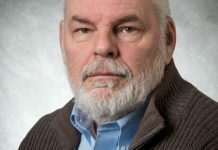 The high-performance aerospace application will focus on large lot production that is primarily manufactured at the original equipment manufacturer (OEM) using in-house equipment (vertically integrated). One such example is a gear used in a rotorcraft transmission box , . A typical batch size for this would be on the order of one-hundred components. The process would start with procurement of bar stock from a mill or third party vendor. A starting blank would then be cut from the bar stock, followed by hobbing of gear teeth. The gears will then under-go a hardening process that consists of carburization, austenitizing, quenching, cryogenic treatment, and temper (in the case of atmosphere carburizing, a machining step may be inserted after the carburization and prior to the austenitizing step). Throughout the hardening process there are also masking operations that use copper plating that is removed/stripped after processing. 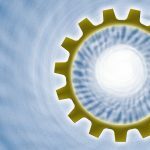 Gears are then ground to remove primary carbides from the surface and to eliminate the distortion from the quenching process during hardening. The gears are then inspected prior to installation in the gearbox (Figure 10). This section will provide a framework comparison for both the racing and aerospace applications outlined above. 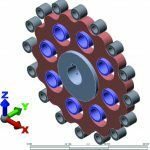 The framework will have some slight variations in the processing as outlined in sections above and the major cost difference between the two applications is driven by the machining tolerances required. A detailed analysis for the racing application that was discussed above is shown in Figure 11. The processing steps outlined are based on the prior discussion related to advantages of vacuum carburizing and the use of Ferrium C61 and C64. The framework is based on all work being completed by outside vendors using a production lot size of 25 components. 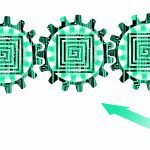 The cost associated with the component production is based on the average of a broader range for each processing step and can be adjusted by each individual based on their internal costs or their preferred vendors. The capital cost of equipment is built into the unit cost by each individual vendor and is not considered a factor for this analysis. The costs represented in the table are normalized to represent the cost for production of a single component. 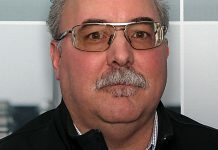 When comparing the use of atmosphere and vacuum carburizing processing for that of the baseline alloy (9310), there is approximately a 10 percent reduction in the overall number of processing steps (translates to reduction in delivery time) and a reduction in cost can be achieved while receiving the same performance. 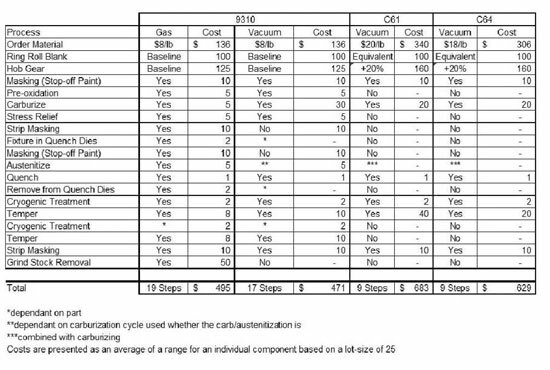 In the case of both Ferrium C61 and C64, there is approximately a 50 percent reduction in the overall number of processing steps, but an increase in cost of approximately 40 percent. The increase in cost for this application is largely driven by the increase in material costs. However, results from components in service have demonstrated up to a 400 percent increase in life cycle. 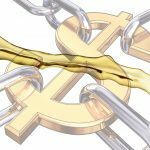 Therefore, there is a tradeoff to be made for upfront cost compared to long-term costs associated the anticipated life of the component when selecting the material for use. 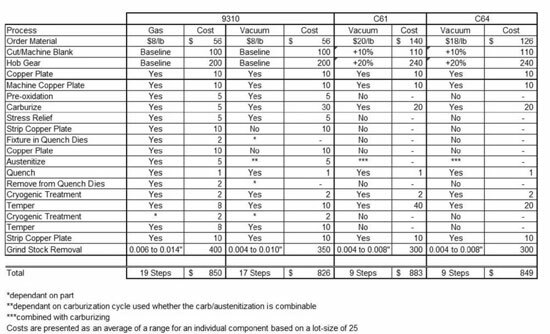 With selection of either material, vacuum carburizing is a more time- and cost-effective method for processing of gears (Figure 12). A detailed analysis for the aerospace application that was discussed above is shown in Figure 13. The processing steps outlined are based on the prior discussion related to advantages of vacuum carburizing and the use of Ferrium C61 and C64. The framework is based on the majority of work being completed internally at an OEM’s facility using a production lot size of 100 components. The cost associated with the component production is based on the average of a broader range for each processing step and can be adjusted by each OEM to match their internal costs or their preferred vendors. 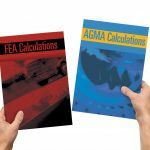 The capital cost of equipment is estimated within the unit cost shown below, but there are several advantages and cost savings that should be discussed from an OEM processing standpoint. The costs represented in the table are normalized to represent the cost for production of a single component. There are several advantages to using the vacuum carburizing process for OEMs. 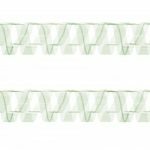 The ability to reduce the copper plating steps by 50 percent allows for an increase in production on a given line or the ability to reduce the number of shifts required for a given line depending on the current production demand. Another advantage to vacuum carburizing is that the components are “cool to the touch” throughout the carburization/hardening process. The parts are loaded and removed from the furnace at or near room temperature, reducing the risk of burn accidents or fires. When comparing the use of atmosphere and vacuum carburizing processing for that of the baseline alloy (9310), there is approximately a 15-percent reduction in the overall number of processing steps (translates to reduction in delivery time) and a reduction in cost can be achieved while receiving the same performance (Figure 14). 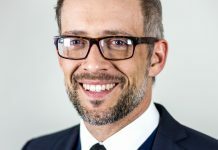 In the case of both Ferrium C61 and C64, there is approximately a 50-percent reduction in the overall number of processing steps, while only showing an increase in cost of approximately 5 percent. With the majority of the costs associated with precision machining to meet the tolerances required for aerospace applications, the cost of the material does not have nearly as great an impact in the overall component cost. Therefore, the ability to increase performance at the same operating cost can be achieved by the use of Ferrium C61 and C64. Ferrium C61 and C64 gear steels have been designed and developed to make use of advantages offered by that of the vacuum carburizing process. The key design advantages that results in manufacturing benefits are based on the high hardenability, efficient M2C strengthening carbide, and MC grain pinning dispersion. The high hardenability allows for complete and uniform transformation of the case and core with the use of milder gas quenches, resulting in less distortion and grinding stock removal. 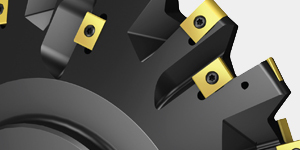 The efficient M2C strengthening carbide allows for a reduction in the amount of carbon necessary for the same strengthening response, resulting in shorten carburization times. The MC grain pinning dispersion allows for increase thermal processing temperatures in both forging and carburizing processes. The ability to increase the forging temperature reduces the flow stress of the material that allows for increased throughput and longer die life for forgings. The ability to carburize at higher temperatures allows for an increase in carbon mobility that also contributes to the reduction in carburization times and allows for the combination of the carburizing and austenitizing processes into a single step. 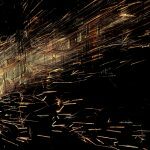 In addition to the manufacturing benefits of both alloys, performance benefits are achieved in the form of an increase in over 30 percent in mechanical properties and over 500°F in thermal stability of the microstructure. 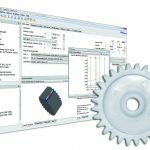 Ferrium C61 and C64 can be cost effective solutions based on a framework analysis of a high-performance racing and a high-performance aerospace application presented above. In applications where precision machining is not a main factor, the material cost typically drives the overall component cost. However, while the racing application provided had an increase in cost of 40 percent, there is up to a 400 percent increase in life cycle based on the increase performance of Ferrium C61 and C64. 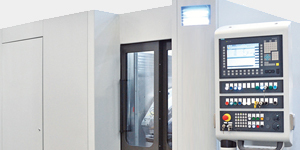 In applications where precisionmachining is a main factor and typically drives the overall components cost, the increase in material cost is negligible. 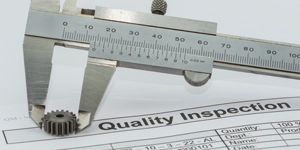 In these applications, the performance enhancements offered by Ferrium C61 and C64 can be had at a similar cost to that of a lower grade alloy. 1) 09FTM14, Design, Development and Application of New High-Performance Gear Steels. 2) Kuehmann, C.J., and Olson, G.B., Computational Materials Design and Engineering, Materials Science and Technology, 2009, Vol. 25, No. 4, pp 472-487. 3) 02FTM07, Selecting the Best Carburizing Method for Heat Treatment of Gears. 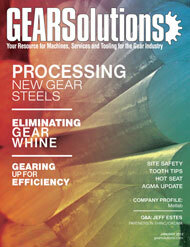 4) Otto, F.J., Herring, D.H., Gear Heat Treatment: Part I, Heat Treating Progress, June 2002. 5) Tom Croucher & Associates, Polymer (Glycol) Quenchants. 6) Powell, J.A., Aronov, M.A., IntensiQuenchSM Process Theory and Applications, April 2002. 7) Henry, Z.S., Bell Helicopter Advanced Rotorcraft Transmission (ART) Program, NASA Contractor Report 195479, June 1995. 8) Kish, J.G., Sikorsky Aircraft Advanced Rotorcraft Transmission (ART) Program, NASA Contractor Report 191079, March 1993.